President Obama traveled to the Everglades in South Florida earlier today to highlight the impact of climate change on the American economy. The irony is that in Florida, where rising sea levels pose an imminent threat to 30% of the state's beaches in the next 85 years, state officials have taken an Ostrich Policy on climate change by banning the terms “climate change”, “global warming” and "sustainability" in any official state communications, emails, or reports. Obama took a tour on the Anhinga Trail in the park on wooden boardwalk over vast 1.5 million-acre wetlands that are served as habitats to diverse species such as alligators and whooping cranes. 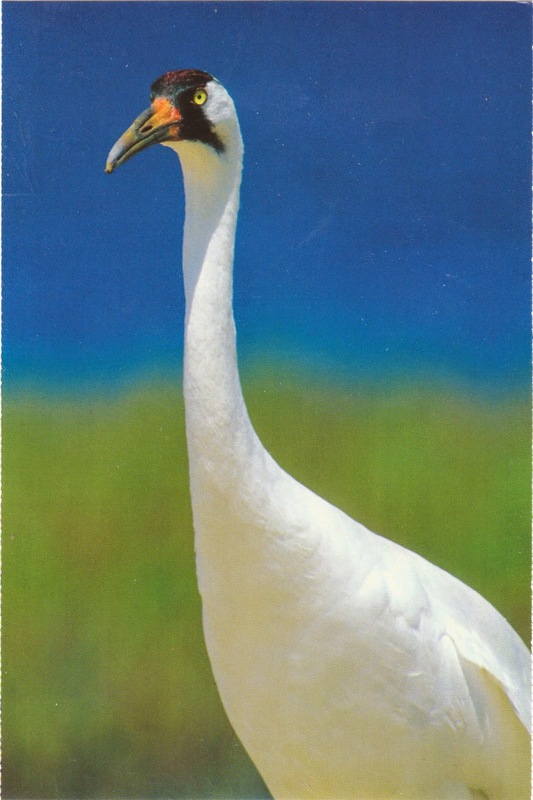 Shown on the outgoing postcard US-3263777 to the Netherlands, a whooping crane can be more than 4 feet or 1.2 meters tall when standing erect. Indigenous to Florida but rare, whooping cranes were re-introduced in the mid-1990s to stimulate population recovery. These species are threaten as their habitats are impacted by salt water seeping inland caused by rising sea levels, which offers a vivid illustration over the relationship between theoretical arguments about carbon emissions and real-life implications. Studies also reveal that rising sea levels are threatening an $82 billion state tourism economy, and drinking water for more than 7 million Florida residents — more than a third of Florida's population. President Obama is using his trip, timed to coincide with Earth Day, to push for an environment agenda that will cut carbon emissions by 28% by 2025 in an attempt to alleviate the impacts of climate change.